Shipping--Over 39$ Free Shipping, You can buy other products in our shop, 80% of the products are now at the lowest price, We ship to all over the world. SPECIALLY DESIGNED FOR NEW 13" 15" MACBOOK PRO! 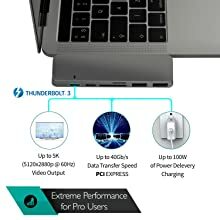 REGAIN YOUR MACBOOK PRO'S PORTS- Thunderbolt 3 (40 Gb/s) , 4K HDMI video output, USB-C data transfer port WITH UP TO 5Gb/s data speed, 2 USB 3.0 and TF/SD card reader with up to 104MB/s data speed. SLEEK BUT COMPACT DESIGN – Laser cut aluminIum enclosure with matching colour and appearance as your Space Gray MacBook. Compatible with both 13” and 15” versions. The portable design makes it easy to take it on-the-go anywhere you need. 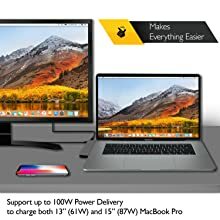 PASS-THROUGH CHARGING - Supports up to 100W power delivery to charge both 13” (61W) and 15” (87W) MacBook Pro at full speed while all data ports are in use and can deliver up to 1.5A of power per USB 3.0 port. SUPERIOR VIDEO OUTPUT - Equipped with both HDMI and Thunderbolt 3 ports. HDMI supports up to 4K @ 30Hz, Thunderbolt 3 supports up to 5K @ 60Hz or two 4K @ 60Hz displays. PLUG & PLAY – The USB-C Hub does not require any software, drivers or complicated installation process. 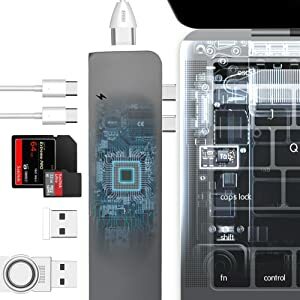 Supports hot swapping/plugging so one connection would instantly connect all devices already linked to it. Troubled by the new MacBook Pro’s lack of ports for your old cables and USB drives? Stop figuring out how to carry all your dongles! The 2BExpert new Type-C Hub fills the gap between the peripherals you need and the new MacBook Pro you love! 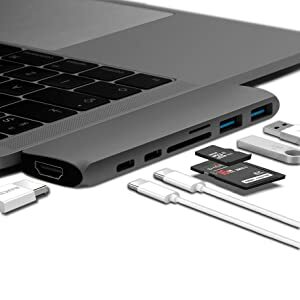 Enjoy your groundbreaking, razor thin, and even more powerful MacBook Pro without being limited by the USB-C ports that make connecting all your peripherals impossible. The 2BExpert 7 in 1 Hub is a sleek and compact multiport adapter specially designed for 2016/2017 MacBook Pro 13” and 15’’. With the sophistication of brushed aluminum, it’s a seamless match to the minimalist look of Apple’s products. 4K HDMI output to extend your display to HDTV, monitor or projector while enjoying crystal clear video display. SD/Micro SD Card Readers support SD/Micro SD card (max 2TB) up to 104Mb/s data speed. 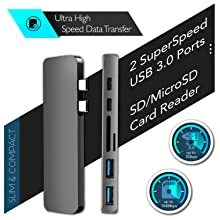 2 USB 3.0 and 1 USB-C (for data transfer only) ports with 5Gb/s data speed. Note: The standard USB-C port only supports data transfer. LIGHTWEIGHT & GREAT ON THE GO, PERFECT FOR WORK, SCHOOL AND ANYPLACE IN BETWEEN. The sleek minimalist design feels like a natural extension of the MacBook Pro, having similar product lines, thickness and rounded edges while the aluminum finish perfectly complements it. 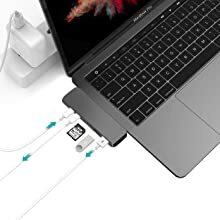 The 2 USB connectors ensure the adapter sits flush against your Mac and it is so versatile you can use it on both sides in whatever position you need for optimal desk management. Doesn't fit with a case. SD/TF cards, cables or other accessories are not included.